Whatever else they do this year, nothing can beat what we have seen this month. Pakistan may go on to win many series and tournaments this year such as the Asia Cup, T20 Championship, ODI series win against England BUT nothing and I mean nothing comes in front or comes harder than what has been achieved over the last few weeks with a high profile test series win against the world number 1 ranked side and that too with a whole test match to spare. It was a major obstacle to compete with, but the hosts have overcome it in triumphant fashion. England came into the series as favourites and Pakistan although they had had an impressive run with series wins without a single defeat against New Zealand, Zimbabwe, Sri Lanka and Bangladesh as well as a commendable drawn series against South Africa and a test win coming back from behind in the Caribbean to level the series, their best bet was considered a drawn affair against England and even the keenest optimists were only settling for a 1-0 series win, but yet Pakistan exceeded expectations which no one could have predicted to break England's unbeaten test run where they hadn't lost any of the previous 9 series, winning 8 of them and standing tall at the number 1 ranking going into the series, but 2 emphatic victories for Pakistan in the end gives them the serious honours and that is that. There was even some talk of comparing this England team to the West Indies of the 80s and the Aussies under Steve Waugh, that's how highly they were rated coming into this series, but Pakistan have beaten them convincingly once and from the jaws of a certain defeat in another. Team Misbah have caught England off guard and when we look back at the year that 2012 is it will be hard to consider a bigger and more symbolic triumph than this test series win over a dominant England side. Broad to Taufeeq: It shaped in and straightened from around the wicket to shatter the furniture and clip the top of the off stump bail which is exactly what coaches’ order for fast bowlers. It was England’s 1st wicket of the series and it was a peach of a delivery to break the opening stand. It was a dream delivery from Broad. Monty to Younis: This was bowling of the highest order as Monty was setting Younis up with arm deliveries angling in to the right hander, but he managed to get one to turn and escape through the defences at speed which Younis had no answer to as the off stump was pegged back by the Sussex man. Rehman to Broad: The left arm spinner bowled him through the gate as he enticed him to drive through the off side, but the ball spun back between bat and pad, handsomely, as Broad was on his way without troubling the scorers after scoring an enterprising unbeaten half century in the first innings. This was the 2nd wicket of the over as England lost their 7th and Rehman had his first 5 wicket haul at test match level after getting many 4 fors before. Ajmal to Bell: Ajmal had his 2nd wicket in 2 deliveries after Bell was caught behind to the perfect doosra which brought him forward, but not totally committed and turned enough to find the edge which Adnan did not spill. The length was perfect, the variation was disguised expertly and the turn was sufficient enough to do the trick as Bell, arguably England’s best player of spin was on his way back with a golden duck. What followed was an abysmal series for Bell with 3 innings without any big score as Ajmal’s uniqueness had him in screws. Hafeez to Cook: Intelligent bowling change from Misbah to employ him into the attack early in the piece and the Professor did the trick by dismissing Cook on the 3rd delivery of the over. The first two balls were interesting as Cook got a leading edge on the first ball looking to work towards the on side and on the 2nd delivery pushed back, but just managed to get the piece of wood down in time to survive, but 3rd time lucky for Hafeez and he had his man as Cook attempted to cut but got a thin edge as Adnan ensured he held on. It was the 1st breakthrough of the series and unsurprisingly it was the professor coming on with the new ball hardness and nipping out a left hander. Trott to Younis: Sharp seam movement from the innocuous Trott who was doing a decent job with his handy medium pacers. Trott got the prize scalp of a 6000+ test run scorer and the hosts most capped batsmen as Younis was looking in pretty sound nick but Trott brought his downfall and prevented him from going on once he got a start. Swann to Rehman: Shoaib Akhtar who was providing his thoughts on the series on a new local TV channel said Manna could no do anything differently on this ball and I agree with him. It spun at speed angling into the stumps and turned enough away from the left hander to brush the top of the off stump bail as Rehman departed in the penultimate over of the day without troubling the scorers. Broad to Ali: It was an attacking length inviting the drive as Ali was tempted into one, but the ball came back and found the way through to send the off stump cart wheeling as Ali departed in the 20s on a test venue where he’s had a stupendous record. Rehman to Trott: This broke the 100+ stand for the 2nd wicket between the left hand right hand combination between Cook and Trott which looked like taking England well into the lead as Trott was castled with a sharp turner from Rehman which pitched down leg and knocked back the off stump. Trott walked off acknowledging the delivery as the 2011 ICC cricketer of the year had his stumps sent down. Rehman removed the set batsmen with an inspirational moment. Rehman to Swann: It turned marginally as Rehman got his opposite number in the final session of the opening day of the series as it pitched on middle and did enough to find the way past and give Swann the long walk back. There was rare turn on that one on a pitch which was doing little. After cleaning up the visitors for 327 with 9 of the wickets belonging to the spinners, the hosts trailed by exactly 70 going into the critical 3rd innings which could make or break the outcome of this Abu Dhabi test. Andrew Strauss’s woes continued as a tentative prod against Mohammad Hafeez brought his downfall as the ball ballooned up in the air for the simplest of catches for Asad Shafiq under the helmet as the England captain departed. Cook and Trott got together and piled on over 100 for 2nd wicket with an antirational approach at the crease as they grinded and nudged the ball around and dug hard to provide some direction and stability to the innings with an effective left right combination. However, Trott was denied a 3 figure score as the slow left arm spin of Rehman foxed him with a splendid delivery that castled Trott. Cook was removed on 94 when he decided not to go upstairs for a DRS when Ajmal spun one back into the pads for an LBW from a doosra delivered from over the wicket just shortly after he had been whipped on the back foot through mid wicket and mid on by Cook for a well timed boundary. Ian Bell who was struggling to read Ajmal looked scratchy and was beaten regularly by sharp turn and bounce, but managed to stay to the end, but down the other end KP drove loosely to an off break and got an inside edge which popped up from the boot to slip where Hafeez held on. Eoin Morgan was in a tangle against Ajmal unsure of the spin imparted outside the off stump as he looked to defend tentatively and was on his way back to the pavilion in the final over of the day as a dismissed batsmen as Ajmal struck in the final over of the day with an off break which found the edge as Hafeez claimed yet another catch in the slip. England went in to day 5 50 behind with 5 wickets left in the tank as Prior and Bell resumed proceedings. Prior was dropped at deep square leg in the early phases of day 5 by Junaid Khan who dropped a dolly, but soon perished as he pressed back to a sharp turning Ajmal off break as he was dismissed in similar fashion to what happened in Dubai last week as Ajmal got his 4th of the innings and 14th of the series. Broad came in and looked positive and dangerous immediately as he got off the mark with a paddle sweep to the very first delivery he faced and looked to take the bowlers on with selective and powerful hitting, unafraid to go over the top. The Nottinghamshire bowling all rounder raced to a timely half century at approximately a run a ball to take England well into the lead with an attacking counter attack. However, Bell fell when Misbah finally decided to take the 2nd new ball before that with one nipping back off the seam as Bell reviewed unsuccessfully. Swann played some cracking strokes through the off side against Junaid who was ineffective and unimpressive, but his stay was short lived as Rehman got him with a straighter one which would have undoubtedly gone on to hit to stumps as Swann was dismissed by spin for the 3rd time in the series. James Anderson managed to survive until tea and played some surprisingly fine strokes against the hard-to-pick Ajmal, allowing Broad to extend his counter attack even further as Strauss’s men were 66 in front at lunch with 2 wickets left and Broad looking in sublime touch still there as 112 were added in a productive and critical session. Nonetheless, Hafeez completed the job by dismissing the two tail ended left handers from around the wicket to strengthen his formidable tendency of getting left handers as the bulk of his scalps even more. The pitch here in Abu Dhabi has surprised quite a few and provided appreciative turn and purchase for the slower men which is expected to get progressively worst and harder for batting. Some deliveries are kicking off and going square, literally. It’s made an intriguing and fascinating contest from what was supposedly meant to be an unresponsive track and the curator deserves to be applauded for preparing a fine sporting wicket. Anything above 200 will be tricky and examining to chase down in the 4th innings and 250-300 in front and the hosts will certainly be favourites to go 2 up and subsequently seal the series. However, they must bat with character in the 3rd innings and avoiding getting blown away by the balanced and penetrative English attack and bat for at least 3.5 and preferably 4 sessions and reach the 130 over mark to get at least 300 on the board. Even 10 or 15 over 200 will give them somewhat of a sniff. Ideally, 350 would be great with just around a day to bowl out England. A total of 400 will really send the chances of an England win out of the window and would be a dream total. The likes of Younis and Azhar need to stand up and make an impression like they did throughout 2011 as they are the only two batsmen who are yet to score a half century in the series from the Pakistan top 6 and both were expected to do well against England, Younis in particular. The inform batsmen and captain Misbah ul Haq who has 3 successive test 50s will need to continue his successful run in the middle order. The tail who all had 0s next to their name from 8-11 will need to take a leaf out of England’s book and show some resistance as their contributions can be vital with 15, 20s, 30s. They for sure will need an improved display and not let England rattle them so easily. The key for the batsmen will be all about being positive and precise in their foot work and defence, using their bat as much as possible and picking up on the subtleties from the finger spinners to avoid LBWs, taking on the bowlers every now and against just to remind them that they are serious about winning so they can break the shackles and occupy the crease easier and perhaps even push the field back and judging the length well against the English seamers and not getting enticed into those loose drives and understanding the bounce of the surface properly. They will need to deal with the mental stress being implied with bat pads who will be chirping away with plenty of noise. Toss: Misbah won the toss and elected to bat first. This is only the 2nd time that they are batting first in the 14 tests that he has captained. Last time they did so they beat the West Indies in Guyana to square the 2 match series in May. Selection: Junaid Khan, the Lancastrian overseas player in 2011 who claimed a memorable 5 wicket haul against the Sri Lankans here in October came in for Cheema whereas for the visitors Monty got a go with Tremlett’s injury ahead of Finn and Onions as England fielded 2 specialist spinners for the first time since the opening Ashes test match at Cardiff in July 2009. Apart from that both parties were unchanged. Pitch and conditions: It was meant to be placid and extremely unresponsive. A dreading experience for the bowlers was awaited. However, there was turn and purchase and to some degree extravagant turn on day 1 for the slower men and it was chillier than usual in the UAE. The crowd was by and large disappointing and rather empty. Ball of the day: There were several - Monty getting Hafeez with an arm ball the very next delivery after he spilled a caught and bowled opportunity. Hafeez misread the length as he went back looking to cut, but the ball skidded through straight to shatter the furniture. Monty was delighted. Shot of the day: Taufeeq off driving Anderson with a firm push down the ground to beat mid off and race away to the fence with excellent timing to open his account and get off the mark on the first delivery he faced in the very first over and 4th ball of the test match with the close to perfect off drive as he capitalised on somewhat of a half volley, probably looking for some swing in the air. Action: Misbah taking Monty on with consecutive 6s over long with some clean striking early in his innings as he took the attack to the bowler coming in at the usual 3 down position in just the 44th over. In the 94th over Misbah took Monty again, it was the last over of the day and he got back to back 6s again with some big blows. POD: Misbah ul Haq who registered his 2nd half century of the series with a classical old school test innings where a time consuming crease occupation was demonstrated to grind out the bowling, churn out the runs gradually, frustrate the opposition, overcome passages when the going was tough, hold the innings together, set a foundation and try and squeeze the venom out of the bowling over a longer period. The key was valuing, respecting and priding his wicket as if his life was depending on it and showing a chanceless approach for digging in deep and long. Misbah, the Pakistan captain will want to add at least 40 more to his score tomorrow in order to earn a well deserved and hard fought gutsy and enduring century. Looking ahead: Misbah needs to bat right to the end and take the odd calculated blow in between and stretch this total as far as possible. If he could last at least 90 minutes or more in the morning and help Pakistan get above 330 that will be a job well done. 300 has to be the minimum target. I feel from an early look that this test will be decided in the 3rd innings and if Pakistan batsmen do not falter they should be able to hang on for at least a draw if not better. It looks like if England have improved on their batting display in Dubai that they will at least get a lead and go in front here and then unleash their spinners in the 3rd innings hoping to get Pakistan skittled relatively cheaply with enough time to knock off the runs and square the series. Pakistan will be more than happy to draw this test and maintain the series lead. The top order MUST bat considerably better 2nd time around, especially Azhar and Younis who have failed so far in the series in order to avoid getting bowled out quickly and give England a strong shout of coming back and pushing for the win. Killing and taking time out of the game will be important from their point of view. Aamir Sohail is a feisty and competitive character and had a successful career as an opening batsmen and useful slow left arm orthodox bowler. Sohail formed a stylish and successful opening partnership with Saeed Anwar which dominated many attacks. Sohail captained Pakistan to the Sahara Cup title in Canada in 1996 and 1998 against their arch rivals and also led them to a test win in South Africa under his captaincy. Sohail completed his studies at university level as an economics graduate. Sohail was Pakistan’s 2nd leading run scorer in their triumphant 1992 World Cup with a century and 2 50s as he was a member of Imran’s cornered tigers that played a fearless brand of cricket to conquer the world down under in the 1992 season. As a commentator and broadcaster Sohail has appeared in many TV channels and commentary teams over the last decade since finishing his career as a pundit and expert. Whilst not everyone likes him and he has his large share of critics, Sohail is a commentator who speaks his heart and voices his opinions openly without worrying about the implications of his views and how they could affect the public’s opinion on him, especially in terms of popularity. Sohail’s commentary is detailed and the technical jargon he applies goes to show a man who knows his knowledge and tactical know how, a man who analyses and watches the game in depth and really applying all the knowledge and experience he had picked up in his playing days to behind the mic with a deep voice and wise choice of words. His passion is evident and Sohail comes across as someone who is a no nonsense and fully serious commentator who holds strong and firm views which he is willing to justify rather than siding with anyone. Sohail was a patriotic servant for his country and was a man of integrity and dignity who blew the whistle against the shady characters in the team by exposing them in the 1990s. I was pleased to see him part of the commentary team for the Pak - Eng series in the UAE. 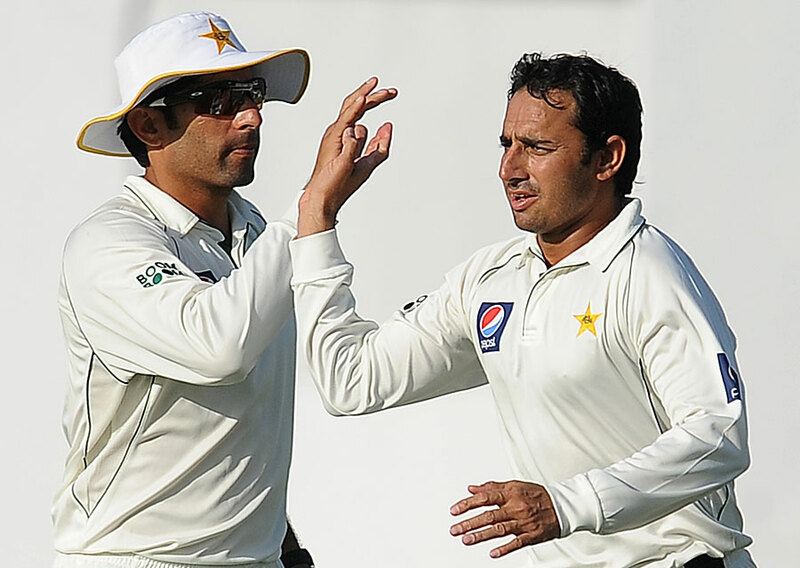 Saeed Ajmal has 93 test scalps in 18 tests. A 7 wicket match haul in Abu Dhabi will give him 100 test scalps in 19 tests which is the fastest by a Pakistani. 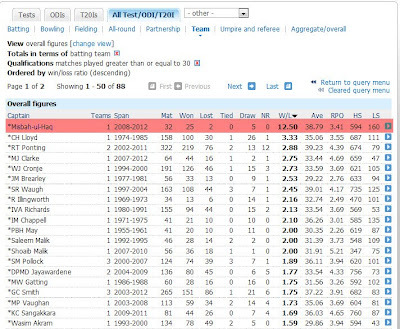 The all time fastest was 16 test matches. The current fastest by a Pakistani is joined between Waqar Younis and Mohammad Asif. The quickest by a spinner, a Pakistani spinner, was the inventive off spinner Saqlain Mushatq who got there in 23 tests as did Shane Warne. After claiming a formidable 10 for against a powerful batting line up in the 1st test in Dubai and full of form, confidence and motivation behind him, one cannot rule Saeed getting there in Abu Dhabi when the 2nd test commences on Wednesday. If he doesn’t get there in Abu Dhabi however, Saeed is surely still going to be the quickest Pakistani spinner to the feat and all time joint quickest by a Pakistani bowler alongside his former coach Waqar Younis and former teammate Mohammad Asif. The wicket in Abu Dhabi however is not really result orientated and provides less assistance to the spinners than Dubai. Nonetheless Ajmal showed in Dubai that he doesn’t necessarily need a helpful wicket to do the damage and make batsmen look foolish. The control, mind games and unorthodoxy is enough to create trouble for the batsmen who have to face the unique challenge of dealing with him. In all seriousness his threat and talent is of such that England will feel they are up against Shane Warne or Murali and will be feeling the greatest pressure since they last faced the two champions and all time leading test wicket takers who got over 700 scalps in the 5 day arena with endless 5 fors next to their name. Were you always a batsman? Who is the person who coached you? At the youth level, not only Internationally, how is the coaching structure for youth? Who was / is your hero? How does it feel to represent Pakistan Under 19, especially at the age of 16? How was the experience of playing in South Africa? Did it teach you a lot about your technique against seam and bounce? You had a splendid tournament and performed really well with the bat, how satisfying was this? 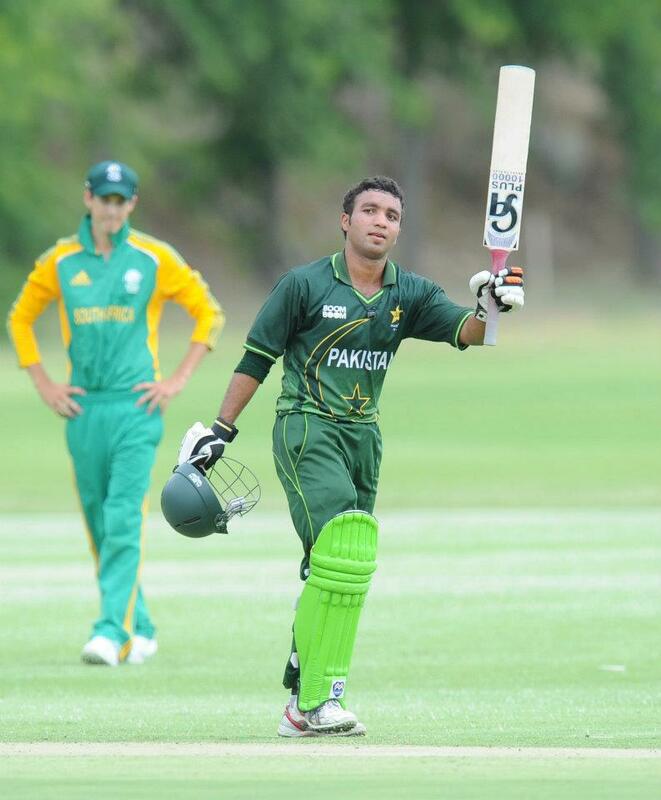 Do you believe, Pakistan have a good chance to win the Under 19s World Cup later this year? Apart from yourself, Babar Azam and Usman Qadir (players that are commonly known) who else are the players to watch out for? What are your personal goals in the short and long- term? You mentioned Gilly, Raina as players you like, but both of these are from other nations so don’t any of our home grown talent inspire you? We have also produced many stylish or successful left handed top order batsmen and middle order batsmen with the likes of Saeed Anwar, Aamir Sohail, Taufeeq Umar, Asim Kamal etc. Don’t any of these names inspire you who went on to have successful careers? Have you watched footage of these players, particular Anwar who was a genius with those magical wrists for finding the gaps? He’s usually a role model for young openers, particularly left handers in this part of the world? I liked a particular left hander who scored a century in Kolkata in 2004 in one of his first ODIs and was the player of the series in the 2008 Kitply tri series between Pakistan, Bangladesh and India. He favoured the off side and square cut deliveries to the fence with authority. He captained Pakistan to a historical test win against Australia after 15 years at Leeds in 2010. He was also Pakistan’s leading run scorer in the 2010 World T20 Championship. The clues are there. I liked him, but it’s hard to take his name now for obvious reasons as I’m sure you understand. From the current team there isn’t anyone though. Saeed Anwar is of course a legendary act, but unfortunately did not see too much of him. Outside cricket do you have any other interests and hobbies? How do you manage education? Are you still studying or is the emphasis totally on cricket now? I am studying in GC University Lahore and have recently gone in to the 2nd year. I don’t get much time to study properly, but still manage to pass exams with my good school time study. You’re most memorable performance up till now at any major level? You haven’t had domestic experience as of yet? Do you feel this gives you a disadvantage playing youth ODIs without any domestic experience as many players already have a fair bit of domestic exposure before playing at the youth level for their country? Not really as I performed well in the U19 triangular series and went on to become the player of the tournament so I don’t think it’s a disadvantage. Every batsman has strengths and weaknesses. As a batsman I’m sure you will know that it’s important that you understand your strengths and weaknesses properly in order to bring the best out of you. What do you consider the 3 greatest strengths about your batting so the audience can learn a bit more about you? What makes you stand out from ordinary or average openers? Where do you see yourself in let’s say about 5 years time? Where do you usually field and how do you rate yourself as a fielder? I am a very good fielder and currently field in the slips during the recently concluded U19 tour of South Africa. I also can field at cover and point. I field in key positions and am always in the action. England were woefully out of sorts in the 1st test at Dubai as Misbah ul Haq’s men outplayed the world number 1 ranked test side to win by 10 wickets inside 3 days and take an influential 1-0 lead in the series. Now, 2 dead draws will be more than enough to give Misbah ul Haq’s side the series honours which will be nothing short of a monumental achievement in Pakistan’s test history and also represent a phenomenal run of rich test form under Misbah’s captaincy which includes beating the very best in the business who went into this series full of energy and optimism for beating Pakistan and even walking over them. Pakistan was expected to compete, but the manner and margin of victory was astounding and least expected. This is the first time since 2003 that Pakistan have won 3 consecutive tests in a row when they whitewashed Bangladesh in their tour of Pakistan in 2003, the series famously known for the match winning knock played by the Sultan of Multan to save the hosts from utter embarrassment. Pakistan has won the most test matches since January 2011 and has been the best test side in the world since then. England have stressed that they are not going to panic,but some decisions need to be made and they will need to get their acts together sooner than later, otherwise this tour could turn out to be a long and miserable one for them. Ian Botham on commentary had suggested one of the reasons Pakistan have been performing so well is by sticking by the same bunch of guys and not chopping and changing too much. This is backed up with the fact that Pakistan have fielded the same 11 in all the last 3 tests that they have played and won. Just like in 2011, Pakistan have started 2012 on a winning note by beating the opposition in the whites inside 3 days by 10 wickets. 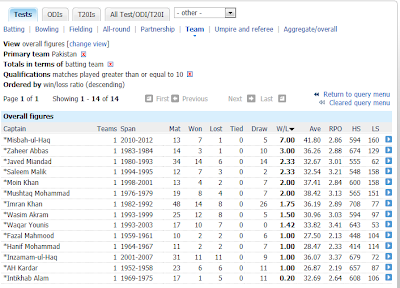 2011 went on to be a record breaking year for Pakistan Cricket. 2010 started with the SCG defeat and a shambolic year followed. 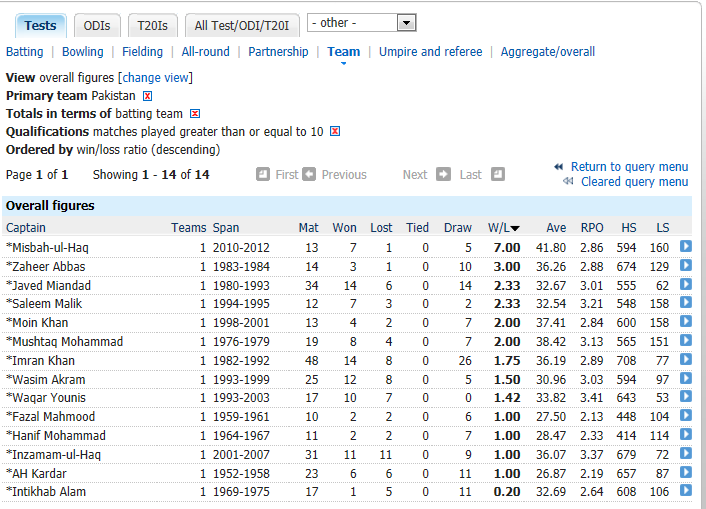 Early indications are promising for Pakistan for 2012. Similarly, Pakistan’s current captain has a master’s degree. You doubt an MBA at your own peril. Taufeeq Umar 9/10: The latter stages of the Sri Lankan test series turned out to be pretty disappointing for him after that marathon double ton in Abu Dhabi which was the 2nd highest by a Pakistani opener after the little master’s Bridgetown epic in the 1950s, but Taufeeq bounced back hard in Bangladesh with a noteworthy score at Chittagong and Dhaka to end 2011 as Pakistan’s leading test run scorer with over 800 runs at average just above 45. Taufeeq was expected to be batsmen who will struggle against England with his technical deficiencies against spin and his unhealthy habit of being trapped LBW frequently when planting down the front pad early, but with his guts and persistence some felt he will be able to get through and he did by being one of the 4 half centurions in Pakistan’s innings which gave them an invaluable lead of 146. Taufeeq was looking solid throughout and drove fluently when the opportunities was there, but received a close to unplayable delivery from Broad which he had no answer to as it shaped in from around the wicket and straightened to disturb the top of the off stump bail. Mohammad Hafeez 8/10: scored a century in Chittagong with his pleasing to the eye timing and placement all around the wagon wheel,unfortunately he had a poor test match at Dhaka and failed to make any constructive impact there, but much to his credit he came back hard in the first test of the series at the DSC where he claimed the wicket of ICC test cricketer of the year and the first wicket of the test series, coming into the attack in just the 6th over before going on to register a crafty 88 and knock off the required runs in the 4th innings unharmed as Pakistan cruised to victory. 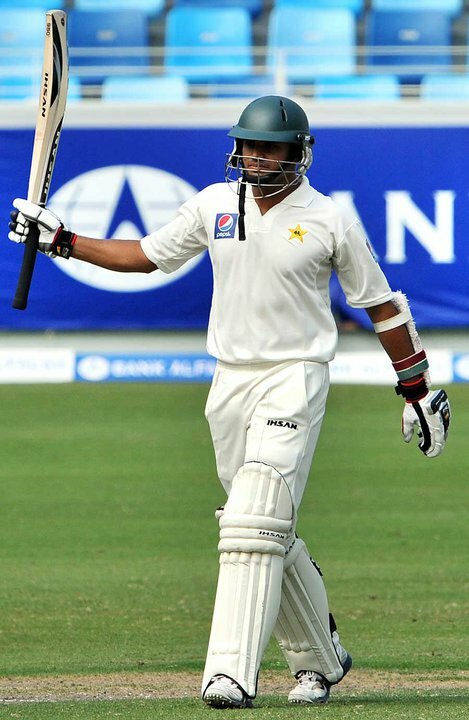 Azhar Ali 6/10: missed out in Chittagong where he was caught behind looking to drive a full and wide delivery, but registered a resilient half century in Dhaka and played a crucial accelerating hand in the 4th innings chase in the fading light with limited time where he expressed him, was willing to gamble and looked assertive in his strokes to ensure Pakistan got over the line. He missed out at the DSC where he was caught behind fishing at a delivery outside the off stump to nick off after just 8 deliveries. We have been used to better from him, but I’m sure he’ll come back hard and bounce back. Azhar has featured in 9 wins, 5 draws and 5 losses in the 19 consecutive test matches he has represented Pakistan. Younis 7/10: scored a double century in Chittagong and an unbeaten one too, he fell one short of getting to the 50 mark in Dhaka where he edged behind to a sharp turning delivery in the early minutes of day 4, but ensured he got the team over the line with Misbah batting 2nd time around. Younis only managed 37 in a total of 338 at the DSC in the first test against the Poms before getting trapped in front to the part timer Jonathan Trott who got one to nip back sharply off the seam. However, after 11 tests since Younis has resumed his career Pakistan are yet to lose with 6 victories. Misbah ul Haq 7/10: also missed out in Chittagong when he was trapped in front for 20, but made a 70 odd in the first innings in Dhaka with some sublime strokes down the ground against the pacers and swept to the fence authoritatively, either reversed or dealt with in orthodox fashion against the spinners before getting an edge to slip which was taken as he attempted to sweep extravagantly towards mid wicket. The unstoppable stopper, irremovable barrier, electric fence and successful national captain concluded 2011 with a humungous 2nd ball mighty six over long off against the slow left arm orthodox spin of Sunny to end 2011 as Pakistan’s 2nd joint leading run scorer with fellow middle order batsmen in Younis Khan. 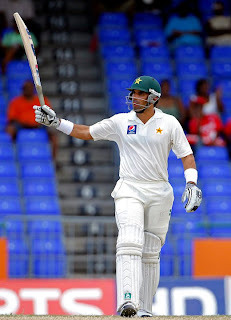 Misbah started 2012 just as he finished 2011 by notching up a patient, disciplined, preserving, resilient, determined, resolute half century which means that he has now got 50+ scores against ALL test playing nations raging from Australia right down to Bangladesh as he delivered the goods in his first test against England in the Gulf. 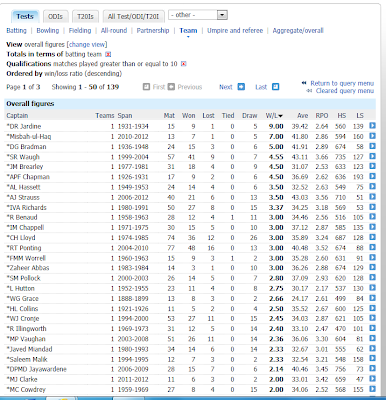 Misbah has now featured in 10 test wins for Pakistan and 10 defeats in 32 tests and as a captain he has 7 wins in 13 tests with only 1 narrow defeat and had been undefeated for 8 tests in a row, winning 6 of them. Misbah is eyeing a 4th consecutive test series win for Pakistan now with Pakistan 1-0 up in the series against England after seizing the initiative and putting England on the trailing button in Dubai in emphatic fashion. Misbah needs 4 more international wins for 100 wins as Pakistan player overall across all 3 formats combined in less than 150 internationals which is a reflection of the calm influence his presence has in the side. Shafiq 8/10: scored his maiden test century in Pakistan’s run feast in Chittagong and made a 40 odd in the next innings he got. As often has been the case in the 16 months he has been in the side he was dismissed out side the off stump whilst looking to hang the bat out there as Anderson’s outswinger gobbled him up in the first over with the 2nd new ball. Nevertheless as always he brings confidence and reliability in the field with his top notch catching credentials and athleticism in general which was evident in the 2 catches he held on to as England were rolled over in no time in the 3rd innings as Misbah ul Haq’s side tasted an overwhelming result. Adnan 9/10: Adnan did not really get a chance to bat properly in Chittagong when Misbah ul Haq decided enough was enough with a lead of over 400, but made a half century, his first one at test level in Dhaka to provide the bowlers with a lead of 132 in a test match which they went on to win relatively comprehensively. Adnan played a vital role in Pakistan’s 10 wicket triumph over the world number 1 ranked test side at the Dubai Sports City when he compiled a crucial 60 odd. Adnan came into bat when the England bowlers had their tail up, were applying the pressure and really bending their backs as they smelled blood to reduce the Pakistani deficit to a minimal and manageable one, but he hung in there and toughed it out to overcome the 2nd new ball. The following morning Pakistan had a lead of 96 with 3 wickets in hand and Adnan was left with the tail. Studio experts such as Butcher and Willis were backing England to restrict the lead to 110-120 maximum, but Adnan spent valuable time at the middle and stretched the Pakistani lead to 146. His presence and stay at the crease resulted in frustration for the English batsmen who would have been looking forward to getting back in the pavilion and just focussing on batting better 2nd time around. His innings must have disturbed their mindset. Adnan held on to 7 catches behind the stumps and hardly put a foot wrong with the gloves. Abdur Rehman 8/10: Underappreciated, underrated. Rehman was the leading wicket taker in Pakistan’s tour of Bangladesh with 11 scalps in 2tests as his slow arm spin troubled the Bangladeshis on the slow and wickets. His presence enables Ajmal to attack more and also pushes him to strive forthat extra mile knowing that he has another performing and dependable spinner in the team. Rehman produced some peaches with his left arm spinners in the 1st test at the DSC, particularly referring to the dismissal of Swann in the first innings which turned marginally to beat the bat and disturb the stumps. Umar Gul 7/10: Gul collected 7 wickets in 2 tests in Bangladesh, but during the 3rd innings of the 2nd test the pacer claimed 2 wickets in successive deliveries in a short burst on day 4 just before tea as he removed Tamim with a bouncer and had Nafees LBW first up with one pitched up. In the first innings he produced an unplayable bouncer to Nafees in the same test which totally stunned him and denied him what would have been a well deserved 3 figure score. Although Gul went wicket less in the first innings at the DSC and was ineffective in his 2nd spell, his first 4 overs were rather tidy and he didn’t give much away. In the 3rd innings at the DSC the experienced seamer was on the money to strangle Cook and Strauss down the leg side, catch KP in a trap bowling short and provide the breakthrough of Trott just before he got to 50. Aizaz Cheema 7/10: Cheema was extremely impressive in Dhaka where he troubled the Bangladeshis with swing and seam in overcast conditions and went on to pick up 6 in the match and 10 in the series with his fast medium pacers. Cheema strangled Trott down the leg side at the DSC and although he didn’t get any 2nd time around he looked threatening particularly to Strauss when sending down some probing lengths drawing the left hander into the stroke. With 21 wickets in 5 tests and a handful of more in LOIs Cheema has been a superb find as a late bloomer in the Pakistan ranks. Saeed Ajmal 8/10: The 2011 New Road overseas star performer ended 2011 as the leading wicket taker in tests and got to exactly 50 scalpsafter picking up 9 in Bangladesh where he bowled well in patches, but wasn’t ruthless as he could have been, but fair play to the Bangladeshis who picked him reasonably well and also didn’t allow him to settle. Where do we start at the DSC? Ajmal was all over England like a rash to claim a match winning 10 for as the England batsmen were bowled out under 200 not once, but twice on a surface which aided batsmen. The hype he had generated was well justified as he spun webs around the English batsmen who were clueless and answerless to his variations in trajectories, lengths, flight, pace, angle, revs and turn. Saeed was named in the ESPN cricinfo team of the year for both ODIs and tests in 2011 and was the only one to feature in both teams which was a testimony to his performances and consistency for Pakistan in a magical 2011 where he bagged 89 international scalps for the green shirts. He started 2012 just where he finished 2011 and showed why he is regarded as the most threatening and best spinner in the world at the moment, in fact the best bowler in the world at the moment. Saeed has not only won fans like no tomorrow with his talent and game changing bowling displays, but with his comical interviews and million dollar smile. England will need to negotiate with him considerably better to stand any chance in this series as they didn’t see that one coming. Ajmal dominated and ripped England out and it wouldn’t surprise anyone whatsoever to see him going on to be MOTS here and also the leading series wicket taker. Saeed was simply in a different league to everyone else. The current Pakistan test team has an uncanny resemblance with its greatest ever test team of the 80s which was their most consistent period in test cricket and towards the end of it they also reached the number 1 spot on the test rankings for a short while. This test team have only lost 1 in 13 tests since the infamous Lords test in 2010 and won 7 tests in between that time including 2 emphatic wins inside 3 days by margins as high as 10 wickets when a tough test was expected. A draw in Abu Dhabi will give Pakistan their 2nd longest undefeated test series streak of 7 series without losing one and ofcourse they will have the chance to extend that even further. The highest was by the team captained by Imran in the 80s who went 10 test series without losing any. Therefore, it wouldn’t be wrong to conclude that the team of the 80s and the current test team are the two of the best Pakistan have ever had in the 5 day arena. The team of the 90s had out and out match winners and record breakers, they were probably the most entertaining, but as a unit they were less consistent and stable in their performances, although they had their moments of spark in between. Below I look at some of current players with those of the 80s and early 90s and see where the similarities are. 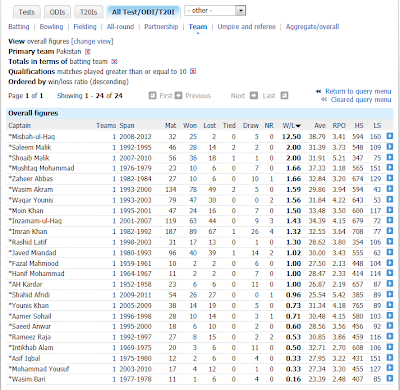 Misbah ul Haq may not have the charismatic and talisman vibe of Imran Khan, but his own performance levels as a captain are definitely comparable where the added responsibility of leadership has positively affected his individual contributions – having the highest average by a Pakistan captain of all time with 11 50s and 1 century in 13 tests as captain including 4 unbeaten 50+ scores in that package. In terms of education levels, he is up there and has been able to command the respect of the players as a result. Misbah ul Haq has always been renowned as one of the smarter men in the team and has been identified as genuine captaincy material throughout his career at the first class level and even in the Pakistan team where he was promoted to the post of vice captaincy just a few months after his comeback and went on to captain Pakistan when previously he did not even have a place in the side, giving clear indications of a captain who is strategically astute. Both Imran and Misbah have played their part in changing the face of Pakistan Cricket when they were totally up against it either through unbearable controversies or lack of firepower in comparison to opponents. Both have provided vast stability and continuity with their presence and acted as the father figure to the team who exceeded expectations and made the team believe in themselves. Statistically, with results under his leadership Misbah’s record is about as great as it gets. Both captained in their late 30s when most would be considering packing up and calling it a day. Abdur Rehman can be compared to Iqbal Qasim, the slow arm orthodox bowler, who will plug away at the batsmen economically and accurately with tremendous control, building pressure, racking up the maidens and enticing mistakes from the batsmen, enabling the more superior spinner to attack and experiment more in shorter bursts as they already have a reliable, but touch defensive persevering spinner holding an end up to keep proceedings tidy with nagging craft. Saeed Ajmal’s psychological tactics to send jitters down the throat of batsmen and give the sleepless nights with his hard-to-negotiate unorthodox variations can only be comparable to Abdul Qadir’s mixture of leg breaks, googlies and flippers which got him 236 test scalps, famously bamboozling England in his home city. Only had he been playing in an era of DRS where batsmen could not use their pad as a second line of defence, he would have had countless more wickets to add to that record. Both have been revolutionising the art of spin, although the obvious difference between an off spinner and leg spinner stands, but both are seen as strike weapons by Imran/Miandad and Misbah who had great faith in their abilities. Azhar Ali as the firm and steady stodgy accumulator who prizes his wicket head and shoulders above anything else, preciously, can only be compared to the immaculate resistance of Mudassar Nazar who based his game around crease occupation for lengthy periods with a high level of discipline, unfazed character and application. Both have the capabilities to play a dogged innings with regularity, basing their batting around workman like values, making batting seem as survival of the fittest in trench warfare, although the approach will be labelled inevitability as pedestrian and sedate from the critics. Adnan Akmal can be compared to Wasim Bari who is a safe bet behind the stumps with his neat and efficient glove work. As a batsmen his FC record is a misleading reflection of his talent with the bat as he has demonstrated in some busy, invaluable lower order contributions he has notched up for the team although Bari was no great batsmen in his day, but a very reliable and technically sound wicket keeper who will not be in the headlines, indicating he was getting the job done and dusted without any fuss. Younis Khan can be compared to Miandad at the time – a worthy street fighter with the bat who will make the most of what he has got and a sharp cricketing mind to pick up on aspects quicker than others and really apply this in match scenarios. Both Miandad and Younis average in excess of 50 for Pakistan at test match level and were/are the influential middle order batsmen who played spin expertly. Their mental toughness and spirited nature cannot be doubted. Additionally, a comparison can be drawn from their catching and fielding in general where both are amongst the best around if not the best. Aamir Sohail can be compared to Mohammad Hafeez – a smart and knowledgeable cricketer who opens the innings with consistency and can attack classily or defend stoutly, playing according to the situation. Also,both can turn their arm over when required for more than handy finger spin. The 3 match test series commences on the 17th of January from Dubai with the next one to be contested from the 25th in Abu Dhabi and finally the last of the 3 sees the series return to Dubai to conclude the 3 test series. We at KP are running a fantasy league for this star marked series. Select your playing 11 within the required budget. Notes: If applicable all players involved in a run out score points. We will update the league points at the end of the series to see who came out on top. Good luck to all. May the best selector win. If you have any further queries regarding how to join or anything else related to the subject please do not hesitate to write in the comments below where we can assist you. Proper preparation prevents poor performance. Since arriving in the Emirates on the 3rd of January Strauss’s men have hit the ball running from the word go by winning both of their warm up fixtures at the ICC global academy in Dubai against an associate 11 captained by Ireland’s William Porterfield and a Pakistan Board side captained by Pakistan’s former U19 wicket keeper in Safraz Ahmed. The confidence levels are high and the team have had a thorough time to regroup and assess their strategy ahead of the first test on Tuesday. England’s preparation has been one of the key factors towards how they have reached the top of the ICC rankings and for the eagerly awaited series against Pakistan this proved no different with England being clinical in their start to the tour. Unlike their last tour in 2005 England lost their warm up fixture against Pakistan “A” before going to lose the 3 match test series 2-0. In the past in 2000 when they beat Pakistan in the dark at the NSK to take the series 1-0 they won both of their warm up fixtures going in to the first test against the Patrons 11 and NWFP Governors 11. 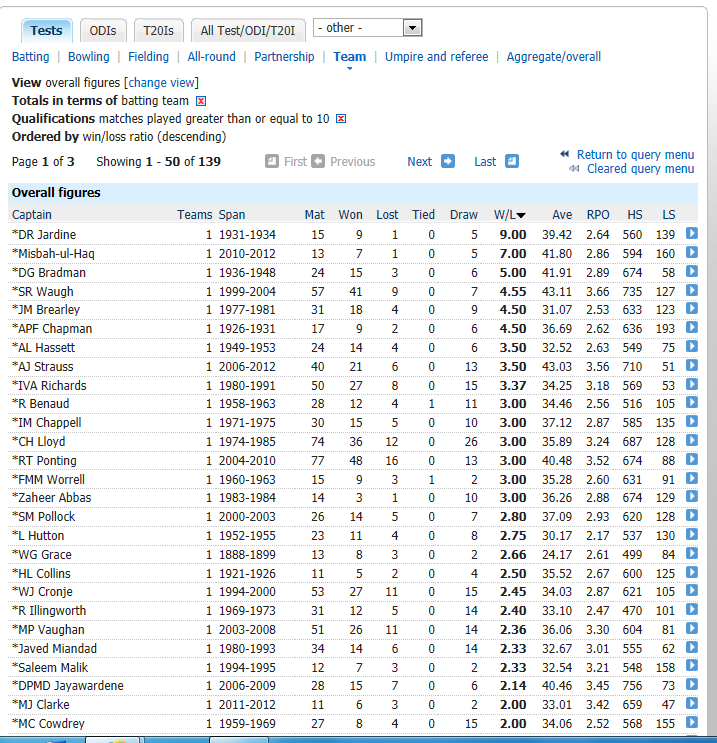 Additionally, in 2006-07 Ashes tour, England had lost two of their 5 warm up fixtures and not won any of them while going on to lose embarrassingly 5-0 which all kicked off after that infamous wide ball from Harmison on the first ball of the series which was a reflection that England was simply unready to defend the urn. However, in the 2010-11 Ashes tour England arrived on board early and got two victories under their belt going into the first test at Brisbane where they managed to hang on for a draw courtesy of the outstanding 2nd wicket stand between Cook and Trott in the 2nd innings which got the visitors out of jail and they eventually went on to win the Ashes convincingly 3-1 with 3 innings victories to win the Ashes down under for the first time in 24 years. It’s evident that England has learnt from their mistakes and value the significance of sound preparation under the well managed and guided Flower and Strauss partnership. The injury of Tim Bresnan is a huge setback for England. The Yorkshire bowling all rounder can be invaluable with the bat at number eight and has the control and stamina to bowl long penetrating spells. Bresnan was a revelation for England and can also reverse the older ball. However, England do have plenty of strength in depth with the likes of Finn and Tremlett who have done well when they have got their chances who could stand up and show their worth and will eagerly want to. However, this does slightly weaken the resistance of the tail as both are genuine tail enders as opposed to bowling all rounders or bowlers who can bat which Pakistan will be relieved about. The accurate and typical English seamer Onions from Durham is also waiting in the wings and got a chance to get back in the whites for England when the main attack were rested for their 2nd warm up fixture. Monty had a memorable outing and outbowled Swann claiming 8 scalps in the warm up fixture against Pakistan “A” and puts his name into the reckoning for the first test. Monty was influential when Pakistan were beaten by England 2-0 at home in 2006 including troubling players of the calibre of Younis and Yousuf who are elegant and secure players of spin bowling. Mohammad Talha who is in the 16 man squad for Pakistan claimed 4 wickets in the 1st innings for the Board 11, but the stand out performer would have to go to Yasir Shah, the legspinner who debuted on Pakistan’s tour of Zimbabwe in September who claimed 8 wickets including a 5 for in the first innings. Young left arm spinner Raza Hasan made a well complied half century although went wicketless with the ball. Fawad Alam made a half century in the 2nd innings, but the team faltered. All in all, England is fully prepared. The warm ups are done and dusted. Now it’s time for the real test to begin. England is in unfamiliar territory and keen to prove their metal in Asia this year with tours of Sri Lanka and India planned later in the year as well as them looking to retain the World Number 1 spot and improve their track record on wickets less favourable to them. They shouldn’t lose any of the away visits this year and will want to win at least one of them, but at home this year they should beat West Indies and at least manage to draw against the South Africans. A testing year ahead and the first mission is Pakistan. Arguably the best in the world at the moment, he is damn effective. Not necessarily attractive, but certainly effective. What stands out is he doesn’t really dead bat or straight bat many deliveries, but still can be extremely resilient, persistent and unflustered in his approach. Trott has a commanding structure and presence at the crease and his wicket is seen as a prize scalp for the opposition. He looks to make the bowlers bowl to his strengths on his hips or legs, controls his scoring strokes all along or neatly placed nudges and works the ball away with ease. He keeps ticking over after group of deliveries or so through a single squeezed out and the odd authoritative well timed boundary in between to break the pattern and put the pressure back on the bowler. His ODI approach has been criticised heavily despite his justified SR and phenomenal dependability and the likes of Simon Hughes and Knick Night have even suggested that team’s purposely try to ‘keep him’ as he appears harmless and allows them to control the flow of runs. However, in his support one can argue he holds it together enabling others to build a score around him. Very strong at driving positively when a half volley is dished up, tucking the ball in front of square on the leg side and nurdling away when the keeper is stood up to anything marginally off target. His averages of above 50 in both versions of the game prove his worth. Team Misbah will need to try to get him early and break the shackles. Late inswing early in the piece can do the trick or alternatively just trying to bog him down as much as possible in the hope of a minor concentration lapse which Abdur Rehman will be aiming to do with his obnoxious nagging accuracy. Very efficient against spin and tends to do well against Pakistan and experienced plenty of success against them with his touch play. Uses his feet very well to get to the pitch, strong at getting back and across for the cut and has firm focus to dab the ball about late as late as one can possibly imagine. Furthermore, a specialist useful bat pad fielder just like Azhar Ali of Pakistan who will be in the action throughout. Don’t be surprised to see Bell pile on the runs. My real gut feeling is he’ll be ineffective or his involvement will be limited to more of a containment or restricting option than a genuine match changer or wicket taker in this series. The keen tweeter has got the ability to turn it on with the bat lower down the order and considering the hosts troublesome recent times to remove tail enders, Swann could have some enjoyable times throwing the kitchen sink and swinging from the hip. Having said that he can be comically dismissed with the bat not shy to experiment and also can land himself into some hater water and let the anger unleash on him when things are not quite going for him which tends to affect the whole morale of the others which is something Pakistan will want to take advantage from if and when the opportunity arises. I’ll keep this one short: Priceless runs down the order. 3 words: Aggressive, assertive, dynamic. The innings he notched up against India last year at Lords when the match was in the balance after England lost wickets in quick succession was a perfect demonstration of his fearlessness to get after the bowling in a bold manner. Also, committed and improved worker behind the stumps who on current form will hold on to anything that’ll come his way. To summarise, dangerous player and important member of the squad. The argument that he should come up the order and slot in at number 6 has been well stressed, however England’s reluctances to play the 5 bowlers, to stick by their 4 man attack with their tried and tested policy which have got them this far results in him staying at #7. You look at capped and experienced members to stand up in important series such as this one. 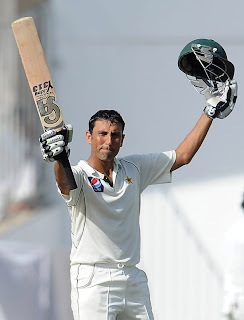 Younis was recently ranked in the top 5 on the ICC rankings for test batsmen and averaged above 80 in the 2011 test calendar year with a century, double century and 4 half centuries. A lot will be expected from him and he’ll be the key wicket England will be looking for. He’s enjoying his duties and role in the current team. Younis is hungrier and fitter than ever. There is a high chance of him going on to be MOTS should the hosts have a successful series. His work ethic, sportsmanship sprit, fighting spirit, quick learning credentials and sharp mind are the stand out attributes of the accomplished middle order batsmen. The forward prod against spinners is dead batted like a genius where even the good length deliveries are quickly dealt with right down to the ground with soft hands with an air of conviction, the adjusted higher bat lift where he looks to get off side of the ball and work back in the V or respectfully greet should it not quite be there and sweep to irritate the length of the bowler. Against pacers, it’s the textbook cover drive which stands out, the run down to third man, the neat flick off the pads when placing the ball fine and the death touch utilising the pace, angle and vacancy or the controlled edge steered away past gully where he watches it onto the blade carefully, dabs it late and doesn’t chase after the line to pick up a boundary from a defensive stroke. Not to forget the full blooded cut and pull which he nails getting into position quickly for slamming hard and neat workings into the leg side to keep ticking over and accumulating. The forward push against the quicker men is kept/seen out tightly where he lines up the delivery and covers the movement, sign of a good player. It’s not just where his batting will have a crucial part to play, but with his advice and suggestions in the field, his top notch catching where the former Pakistan captain is a handful. Younis will be influential. 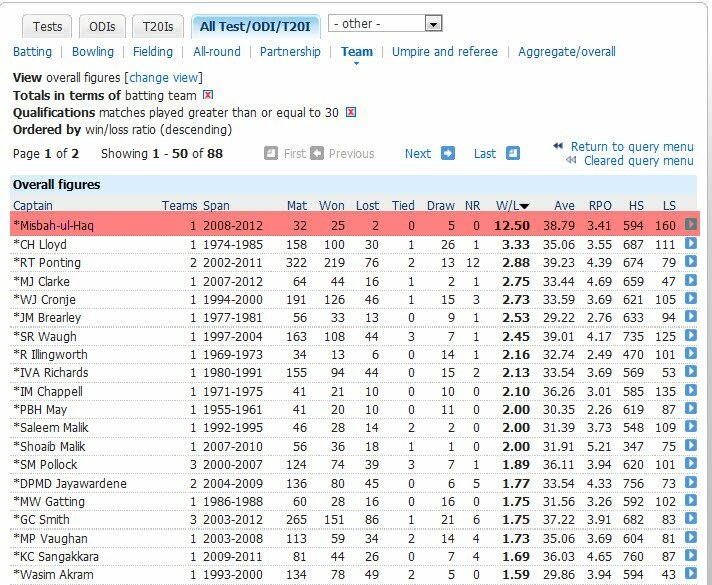 Misbah ul Haq has the 2nd highest average by a captain after Sir Don with a remarkable batting average of 75 after 12 tests with the skipper’s arm band. Misbah has scored 10 50s (3 being unbeaten) and 1 unbeaten century in 17 innings as captain (excluding single figure not out scores). He leads from the front, relishes responsibilities and the burden of captaincy doesn’t affect his performance. The added responsibility is an area where he thrives. Also, a fine fielder who claimed 30 international catches in 2011. The world underestimated him when he was appointed captain in October 2010 and now it’s safe to say that the appointment was a master stroke. The captain is a resistant player of spin and medium pacers, who can defend stoutly, apply himself at the wicket, handle proceedings with purpose and measure, summarise situations efficiently, price tag his wicket as the toffee apple who the opposition will savour more than the rest, improvise innovatively, nudge away and get stuck under the opposition’s noses and act as the ‘glue’ to the innings. Spirited resilience, stamina and cunningness are some of the many characteristics he possesses. The trade mark stroke is the push into the on side through mid wicket and mid on when a pacer strays in line and as for the spinners it has be the one knee special slog sweep and paddle sweeps. Every now and again Misbah is willing to bring his one day game into it by backing away, exposing his stumps, reverse sweeping, chancing his arms. In short, amazingly consistent, yet unpredictable in his approach as he has a range of gears, but the resoluteness is what is required more often than not where the skipper can be repetitively rock solid with those forward pushes, keen prods, watchful traps, backfoot taps and harmless leaves. Undoubtedly, the best find for the hosts in tests over the last few years is someone who will absorb the pressure, grind in for the long vigil and stabilise the innings and ensure his resilience, resistance and endurance is evident to one and all. Azhar is a classical and technically efficient old school stylist who will demonstrate spirit, guts, determination in abundance. If you value mental toughness, discipline, gutsiness, steadiness and an unflappable temperament you will enjoy watching his approach. I expect Geoff Boycott to sing his praises and really rate him in a high regard during his radio stints with TMS. It’s his style of operation, trust yourself, vow not to make the slightest mistakes and risky freely look to overcome passages and graft away unfazed with a tidy defence along with controlled shot selection being the forte. If you don’t get him early, you have your work cut out as he will not get frustrated by being bogged down and eventually will gradually squeeze the oxygen out the bowling attack by wearing out the attack, building lengthy partnerships and closing an end down shut up stop. England will inevitably have some flat days in the field, should Azhar get going as he has come on in leaps and bounds make no mistake about that. Azhar greets the ball on merit, switches off well in between balls, goes through the repetitive processes, maintains strict discipline and is happy to play the unexcitable 2nd fiddle roles. The cat and mouse battle between him and Swann should be interesting as he will not get sucked in and will inevitably firmly stand by his concentration and patience even if this means blocking out the maidens, picking the different trajectories and waiting until the rank bad ball arrives. In the bowling department it can be none other than that mysterious, wizardry and unorthodox finger spinner. It’s as self explanatory as it gets. His ‘doosra’ or the other one can be unpickable, a variation disguised, controlled and executed expertly which turns, dips, cuts, jumps and bounces on the batsmen. Ajmal can also bowl the one skidding and shooting through out of the hand and a top spinner with revs, bite and bounce which he utilises a lot, especially when bowling from around the wicket to a typical right hander. Like any offie, the off break is the bread and butter delivery turning back into the right hander and going away from the left hander. Ajmal has top control over his off break which enables him to set up batsmen and insert pressure. He can also change his arm action and point of release either darting them in, slanting them in or holding them back. Ajmal also varies his grip and seam position to get a little extra on the ball and change his pace. It’s difficult to sweep and use your feet against him. Just occasionally he drops short and gets impatient, but by and large England would need to have done their home work to combat the threat of Ajmal and his magical kink. There is every chance he will be the series leading wicket taker. England will have his match winning spell at the Oval at the back of their minds where he bowled unchanged and tore the England batting apart with the disgraced Mohammad Amir and exploited their vulnerabilities against spin by gating the batsmen between bad and pad as if they were puzzled.